The way Larry Correll-Hughes sees it, the Carlton Union Building expansion will have a domino effect on the Stetson University campus when the next phase opens in August 2018. 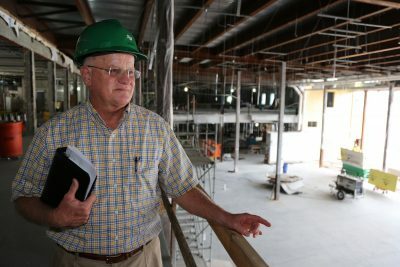 The second floor of the CUB’s new North Wing will be ready when students return for Fall Semester 2018, offering student meeting rooms, a student lounge, and space for student organizations, such as the Student Government Association and Hatter Network student media and its online-radio station. 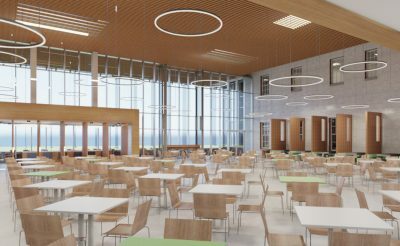 A rendering shows the new Commons Dining Hall, set to open in August 2018 in the Carlton Union Building on Stetson’s DeLand campus. The renovated and expanded Commons Dining Hall will be completed, too, with a larger and more open kitchen, new serving areas and new dining room with a wall of glass overlooking a covered patio and green space. Student organizations currently are located across campus – from the duPont-Ball Library to the Lynn Business Center. The new CUB will bring them together in a central gathering spot for students while also having the domino effect of freeing up space around campus for other uses. “People are using spaces in the library or in the wellness and recreation center or even in the LBC in ways that a student union should actually be used — as a living room, a place to go and be together in community, be involved in what’s happening, and get resources,” he said. Last August, the first floor of the new North Wing opened with a larger bookstore, post office and copy center, as well as the CUB in the HUB information desk, during the first phase of the project. After the second phase opens in August 2018, the third and final phase will bring a renovated South Wing with a new Coffee Shop, Faculty Lounge and a grander South Lobby at the end of 2018. The third phase also will include renovated offices for Hancock and other staff in Campus Life and Student Success on the second floor of the South Wing. 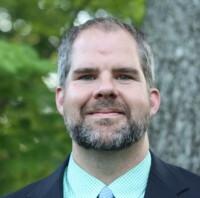 The project is progressing on schedule, said Al Allen, Associate Vice President of Facilities Management, emphasizing that the building is being constructed to last for many decades to come, like the original building, which was constructed in the late 1950s. Workers recently, for example, constructed new columns across the back of the CUB that are built on piers drilled 68 feet into the ground.